Infinite Art Tournament: The Great Movies: "It's a Wonderful Life"
Previous Contact: I saw this movie in its incarnation as a television holiday special two or three years running in late adolescence, when I was way too cool for anything that smacked of conventional family entertainment. I have carried with me the idea that the movie is insufferably treacly and sentimental. 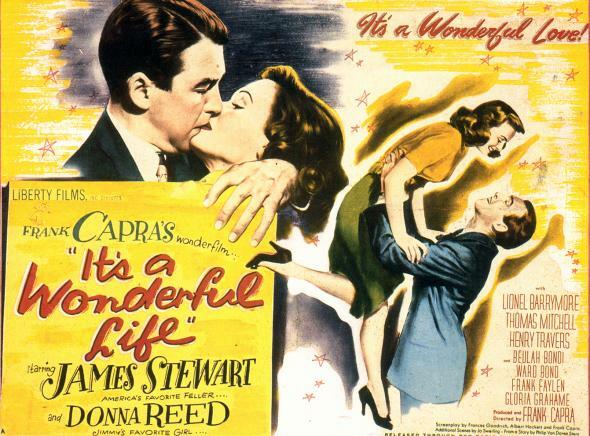 It is not coincidence that we reach It's a Wonderful Life so late in the Great Movie project; of the entire list, this is one of the ones that I least looked forward to watching. Not surprisingly, my decades-old teen memories of the movie were not entirely accurate. In fact most of the first hour seemed pretty new, and the part that I thought occupied the bulk of the movie.... Well, before I go on, I should say, on the off chance that you don't know the movie by heart, that I'm going to plunge immediately into spoilers. So! I had thought that the bulk of the bulk was George Bailey's return to see the world as it would have been if he had never been born. In fact, that sequence and the memorably dopey angel Clarence don't show up until an hour and forty-three minutes into the action. Until then, it's all George's backstory. And although this backstory can be seen as a gradual but unrelenting destruction of a man's hopes and dreams portrayed strangely as upbeat comedy, it is actually pretty charming stuff. Along with some genuinely seedy establishments, the alternative town we are shown to illustrate how horribly things would have gone had our hero never been born features -- a thriving entertainment district! With jazz clubs! The world is so awful without Mr. Bailey that, had he not been born, his wife would have had to support herself as a professional single woman! As... a librarian! The horror! The horror! The notion that the inhabitants of any town, anywhere, at any time in history, would spontaneously rise up and pool their money to save a beloved local banker from financial scandal is a far more radical fantasy than the notion that your guardian angel might show up to show you how the world would have looked without you. It's supposed to be heartwarming, but it's so over the top that it's just kind of bizarre and hilarious. Also: would it work? The bank examiner is standing right there, and he's still kind of legally and ethically obligated to find out why there's money missing from the till in the first place. Despite very respectable child acting throughout the picture, little Zuzu ("Zuzu"?) Bailey's final-curtain pronouncement that "Teacher says, every time a bell rings an angel gets his wings" is so damn grating that one really does wish in that moment that her dad had never been born. There is also, I feel obliged to point out, a logical problem in Clarence's shock-and-awe campaign to bring ol' George back to his senses. It is this: the fact that everything he has done in the past has made the world a better place does not by any means guarantee, or even logically suggest, that his continued existence will continue to yield social benefit. Nor does it contradict Mr. Bailey's conviction that, in the present moment, he is worth more to his family dead than he is alive. Just saying. But having said all that, I will now admit that I also found It's a Wonderful Life pretty delightful. It is funny, charming, and moving, and has its heart in the right place. James Stewart and Donna Reed play the romantic leads with a sort of effortless style and naturalism. The good folks of Bedford Falls embody the middle class virtues, and if the town is a little drab -- you can certainly understand why George Bailey is forever itching to move on -- it is also captures, in a romantic sort of way, some of the best aspects of American town life. An interesting aside: after an unremarkable theater run, It's a Wonderful Life was pretty much forgotten for thirty years. It was reborn in the 1970s, after a clerical error put its copyright into legal limbo until 1993, as which point Big Media got its claws back into it. In the interim, it became a popular holiday staple for local television stations -- remember those? -- because it was essentially free material. From this yearly exposure, it became the popular and iconic fixture of our national culture that it is today. Having seen the one that got away, it's hard not to grieve for all of those films, books, and recordings, masterpieces doubtlessly among them, that are systematically suppressed by a body of intellectual property law designed to maximize the revenues of vast entertainment media corporations. But I digress. Plot: A bright and talented young man repeatedly puts service to the community over his personal desires, displaying a level of selfless social virtue that would have made a Soviet propagandist blush. When a relative's foolish error threatens to destroy him and everything he has worked for, a series of miracles occurs to redeem him and return him to beloved wife and children and his life of disappointed self-abnegation. Visuals: Well-made in black and white, with lots of nice touches in foreground and background. Specific moments I liked: approaching the dinner table in his new house, a "fixer-upper" if ever there was one, Bailey must duck around a small waterfall coming out of the ceiling. Or, when a policeman fires a shot at him in the alternate universe, a letter goes out in the electric "Pottersville" sign in the background. Dialog: Fun for the whole family, except for surly adolescents. The humor is sometimes pretty broad and obvious, but often subtle and even a bit racy. The dialog helps give the movie a rich texture, too -- the plot is anything but hard to follow, but it's unlikely that anybody will catch everything that's going on the first viewing either. Prognosis: If you live in the United States of America, this movie needs viewing for the sake of your cultural literacy cred. But gosh, it's unlikely you haven't watched it already. I think I'll let my credentials lapse on this one, esp. now that I have the patented M5K Movie Cliffhanger Notes (TM) to refer to. With pretty much the only thing I've ever seen being the tooth-rotting bell/angel outtake used in ads, I've never wanted to watch the whole thing anyway. "The notion that the inhabitants of any town, anywhere, at any time in history, would spontaneously rise up and pool their money to save a beloved local banker from financial scandal ... Also: would it work? The bank examiner is standing right there, and he's still kind of legally and ethically obligated to find out why there's money missing from the till in the first place." -Er, I don't pay a lot of attention to this sort of thing, but didn't this just happen on a national level? I do hope that 'Naughty Marietta' is on your list!!!!!!! I actually remember being bored of this one the first few times I watched it as a kid / teen. But watching it as an adult I really appreciate it, in spite of it's sentimentality. George is the good son in a kind of 'prodigal son' story... the one who stays behind for the good of home & family. It's very gratifying to see him rewarded at the end, to see that all he's invested in the community comes back to support him. E: I'm not sure you wouldn't like it. That moment is definitely the low point. nichim: If I understand the question right, I'd argue that the exact opposite happened. The national inhabitants have been generally disposed to let banks fail to prove a nice moral point. For better or worse -- better, in my way of thinking -- The Man propped the banks up in order that the concept of money would keep working and we could all avoid the inconveniences of an abrupt return to a preindustrial economy. It's this kind of intrusive Federal meddling that makes me so obnoxiously amenable to government. Elaine: If Naughty Marietta is on my list, I'm certainly not going to say so in a forum known to be frequented by Mrs.5000. Rebel: I agree and I don't. Yes, it's very gratifying to see him rewarded at the end. And yet, I can't help fast-forwarding two months: he's still trapped in the shabby little town that he has always wanted to leave but that can't do without him, bearing its sins while his Savings and Loan continues to die its long, slow death, deprived by the townpeople's Yuletide generosity of the dignity of a swift demise.... But this may be an unnecessarily pessimistic reading of the film.